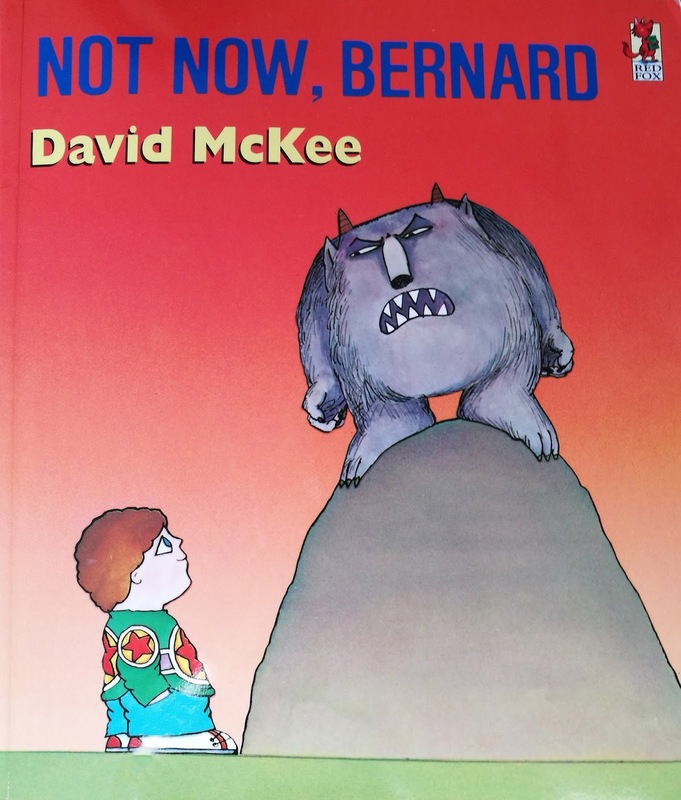 In the latest of our series on illustrated books that have impacted the development of illustrator members, Katherine Lynas has chosen David McKee's classic picture book Not Now Bernard. The stories that stick in my mind from my childhood are filled with danger. Stories with sad endings even more so. Possibly because they differed out from the 'happy every after' tales. The Little Match Girl, The Little Mermaid (non-Disney version) and Molly Malone, a song with a strong narrative, were the main stand outs. Though, I always loved stories with humour and surprises. I recently took part in a Skillshare class 'Art School Boot Camp: Developing Your Style' by Christine Nishiyama, and created an influence map. This exercise reminded me of the stories I grew up with, and helped me notice some common themes. 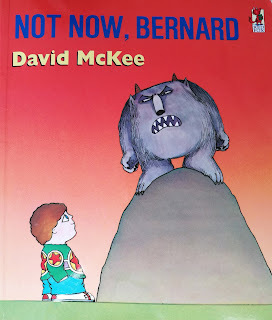 Not Now Bernard (first published by Andersen Press in 1980 and repeatedly since) was always one of my favourites. Funny, with a great twist and full of peril. Bernard tries to alert his parents to the presence of a monster in the garden. Ignored, he goes to talk to the monster, who promptly eats him up. 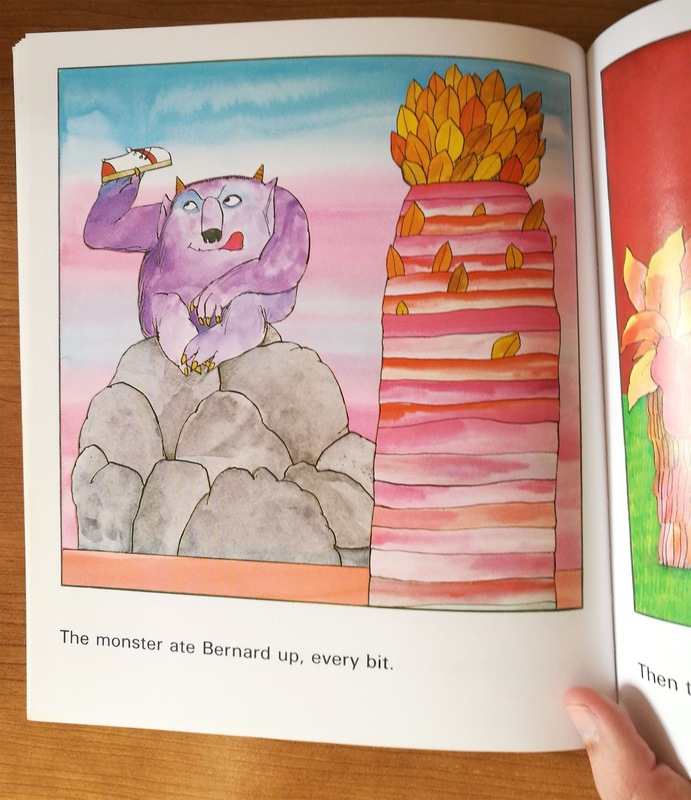 The monster then steps into Bernard's role, and is also ignored by the parents, even finding himself tucked up in bed at the end of the day. I think this book works so well as the reader is in on the joke, there is an air of disbelief. He ATE Bernard! They haven't even noticed! Even the monster seems quite shocked by the situation. Every child knows what it's like to feel ignored, whether they are waiting for a parent to finish talking to a friend, or waiting for them to help with a task. Interestingly, the moral here is directed at the parents rather than the child. I found that rather refreshing. 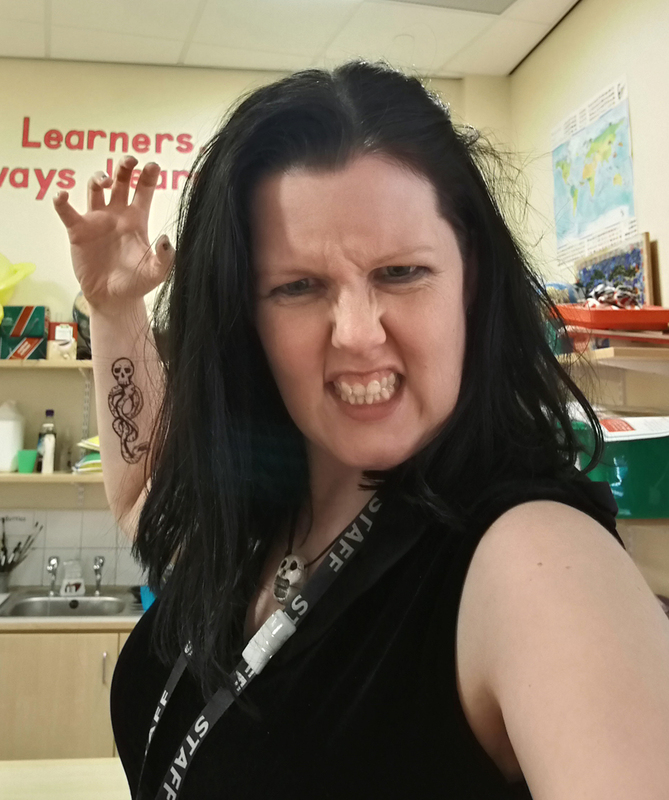 In Not Now Bernard the problem isn't solved, it is just transferred to the monster. This results in circular narrative, as the threat (the monster) becomes the victim. This story was quite reassuring to me, as a child you might feel ignored from time to time, but you don't have it as bad as Bernard! David McKee has illustrated the book in a very graphic style, with strong colours and patterns used throughout. The illustrations often have quite large areas of block colour, but there are still things to spot. Elmer even makes an appearance. 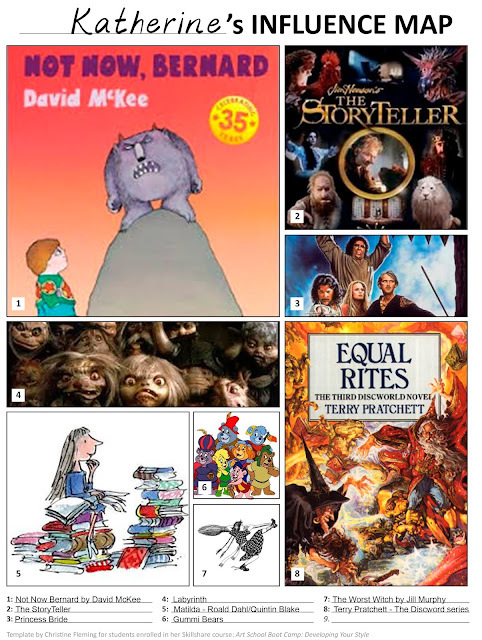 Growing up, I loved several David McKee creations, particularly Mr Ben and King Rollo. His books explored danger and adventure, were never scary, and were filled with a great deal of warmth. 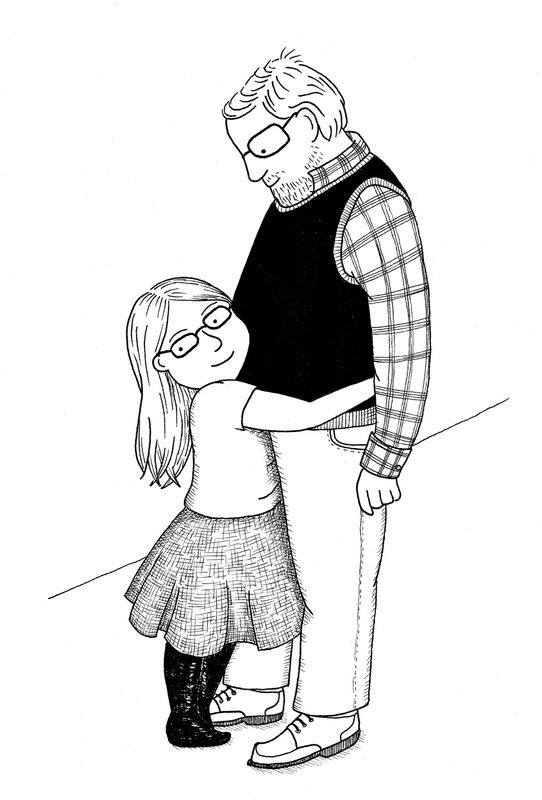 A few years ago I drew an illustration of a grandad with his grandaughter. It is still one of my favourites, because I feel I caught something of the love between the characters. I'm currently looking at developing my colour work, and layouts. I can feel my early influences pointing me in the right direction. Katherine Lynas is an illustrator/ Teaching Assistant from Saltburn-by-the-sea. She is a regular member of the NE group, and is sometimes found hanging from a trapeze. Great post Katherine! It was a recurring reference at the retreat and is just such a brilliant book. One of my favourites. I love that drawing of yours. And Not Now Bernard too. I once set it as a text for illustration students who didn't know the book. Not one of them dared end with Bernard being eaten up - they wrongly thought children would be upset!